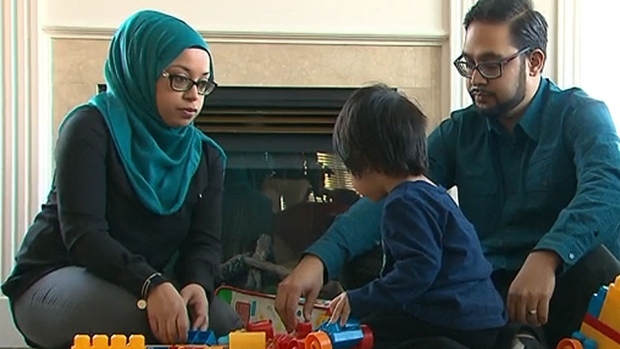 Six-year-old Canadian Syed Adam Ahmed garnered national attention when he needed special security clearance to fly to Boston for the NHL Winter Classic -- but he’s far from the only child to be mistakenly caught in a “no-fly list. Sheldon Ali says his son, Naseer Muhammad, was held up before flying for the first time when he was only 10 weeks old. "We know it is going to happen every time," said Ali. Repeated incidents have led Ali to believe that his son has been targeted because of his religion and ethnic background. "My son's name is Muslim. We are Muslim. So it leaves me to believe (that) this is a form of racial profiling," he said. Likewise, Syed Ayden Hussain was only 19-months old when he and his father, also named Syed, were held by border agents during a trip to the United States, only to be later released with no explanation. "We had to submit our fingerprints ... they did retinal scans and took pictures of us," said his father, Syed Hussain. Zamir Khan's son, Sebastian, was only six weeks old when he faced similar treatment before boarding a flight. Khan said that he asked the Canadian government to intervene, but they said they could only offer assistance if his son was barred from the flight. "I was informed that as long as he was only delayed by this, and not actually denied boarding, they can't help us," he said. Following the incident involving Ahmed, Public Safety Minister Ralph Goodale promised to investigate the issue. He said the Liberal government pledged to review issues relating to "no-fly lists," as part of a broader plan to repeal the "problematic elements" of the previous government's anti-terrorism law, Bill C-51 -- which the Liberals supported. However, Muslim groups are looking for concrete steps to improve the process and prevent the wrong names from landing -- and staying -- on the list. "There has to be due process … before a person is listed," said Khalid Elgazzar, lawyer and vice-chair of the National Council of Canadian Muslims. David Lyons, a professor of surveillance studies at Queen’s University, told CTV News earlier this week that there is "great secrecy" concerning the make-up up of no-fly lists, as well as their creation. And some security experts argue that they repeatedly victimize innocent people. "The burden of proving your innocence falls on the person who has been deemed guilty, and they have no idea why," said Emily Gilbert, a security expert and professor at the University of Toronto.